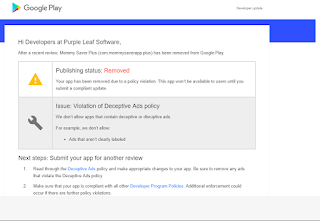 Purple Leaf Software: Google Removed (ad-free) Mommy Saver Plus for "Deceptive Ads"
I got an email from Google saying they removed Mommy Saver Plus (the paid version of Mommy Saver) for "deceptive ads". This is strange because Mommy Saver Plus has no ads. Hopefully this will just get fixed and go away in the next couple days and I'll have a good laugh about it later. 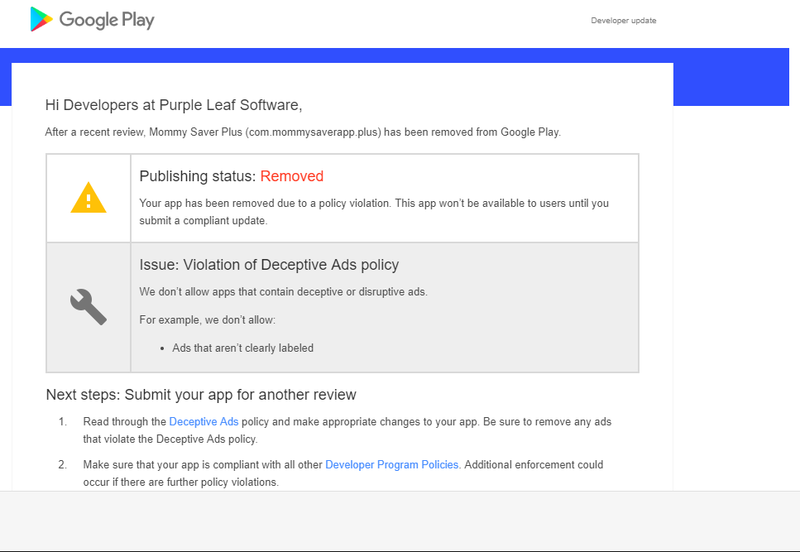 To Google's credit, the email says I can "remove any ads that violate the Deceptive Ads policy" and re-submit the app. They apparently also have an appeals process (I've already submitted the appeal 2019-03-25). 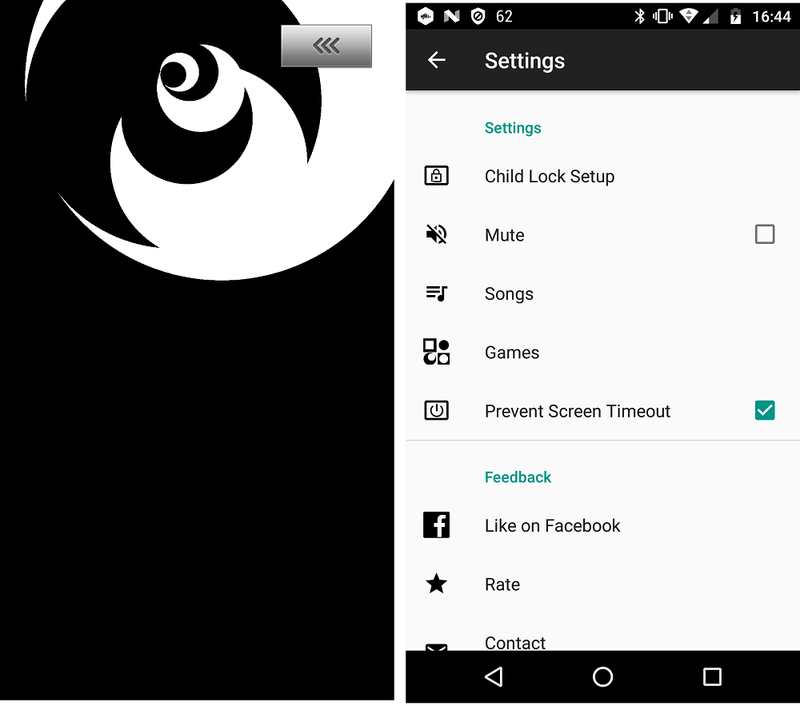 I'm not familiar with Google's ad policies, but it's a little strange that they would remove this app anyway. I'm also a little worried because I've read on HN horror stories about Google doing things like this or worse. I'm nervous about re-submitting until I see the result of the appeal. Mommy Saver Plus doesn't make much money, but I want to publish a new app in a few months and don't want to have problems with that. And I definitely don't want problems with my Google account. If anyone knows anything useful, I'd appreciate it. 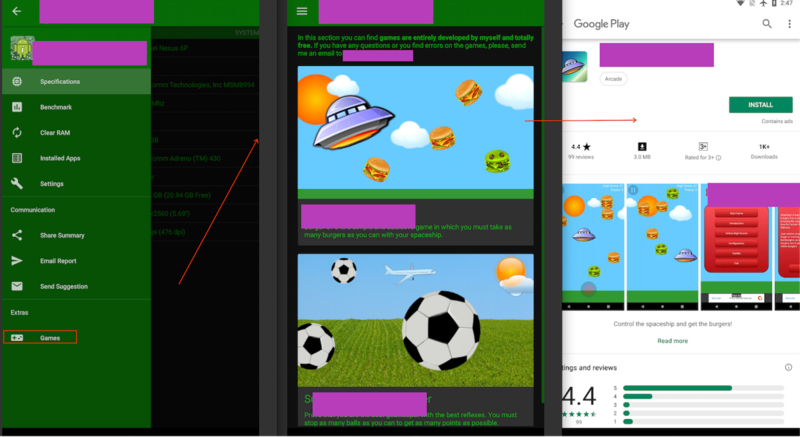 Googling for "play store removed mistake" doesn't yield much useful results. Good luck man. 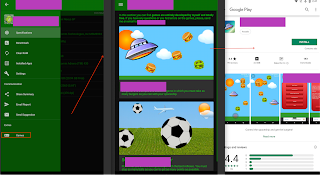 I had an app removed because someone did a review of it and their review had screenshots of my app and Google banned the app for copyright infringement siting them as the source. No appeal, one strike, never got through to a human. How is that not false representation? That's something worth involving lawyers, IMHO. Please post a follow-up if (when) you'll receive reponse from Google! Good luck. I got an app banned, then my account (I cannot use google pay anymore as a consequence) and I have no idea why. Tried multiple times to know the issue but 0 luck. Since then, anything Google related is completely off-limits. This is what really worries me, much more than this particular incident. The app was going so well I was planning to start living off that. Then one evening I received an email to notify me of the shutdown and from that moment it's just been sad. Because of that, I am no longer an android developer and have moved elsewhere. It totally changed my view about Goodle, and it's been 3 years already. I still remember the countless hours spent on it, for nothing. Never again. A second post on this matter. Awhile back there was another person who had his entire business shut down by Google as well. Same root problem. I should probably update my comment in that post. Bots and algorithms with the power to determine who "lives" and "dies" with no ability to speak to a human. Even if a human is reached, that person has so little ability to do anything they might as well be a bot. I have the same fears you have. At a whim with zero chance of appeal, ones entire access to anything Google related just vanishes. Google runs an orwellian world in its own ecosystem. The judge, jury and executioner is the played by a flawed bot and the humans are relegated to face-puppets. Many don't see a problem with this now, but imagine a future where a robot-cop catches you on the street for an apparent "jaywalking" and promptly passes your sentence on the spot, to be exiled outside the city confines. You proceed to file an appeal while living in the slums but to no avail since the enforcer, judge and appeal sections are all run and owned by the same system.